Some 250 million years ago, back when the world was still comprised of the single, supercontinent Pangea, a geologic catastrophe wiped out nearly every single ocean-dwelling creature on the planet: fish, crustaceans, mollusks, even microbes. As few as 4 percent of ocean species survived, including, most famously, the Nautilus. On land, about 30 percent survived. It was the worst extinction event in Earth’s history. Appropriately, scientists nicknamed the event the “Great Dying” (also known in science speak as the “Permian-Triassic extinction”). But despite the magnitude of the disaster, only in the past two decades did paleontologists find clues of it in the fossil record—and discover it coincided with a massive volcanic event in modern-day Siberia. Now, a new study published Thursday in the journal Science suggests the culprit of the Great Dying—and the connection between the two events—was likely something the planet is all too familiar with today: global warming, and, as a result, high ocean temperatures and a loss of oxygen in the water. And, it turns out, this millions-year-old event might be able to serve as a warning for our own future. The authors write that the combination of those two factors—warming water and low oxygen—“can account for more than half the magnitude of the ‘Great Dying'” in the ocean. Both factors, of course, are still at play right now. Here’s how the authors got their result: While scientists had long guessed a warming climate played a part in the Great Dying, they hadn’t come up with a way to prove it. In order to test the theory, the team simulated ancient global warming with a model of Earth’s climate and predicted how ocean warming and oxygen loss would affect where ancient marine species could survive, based on the tolerance levels of animals alive today, including fish, crustaceans, sharks, corals, and mollusks. 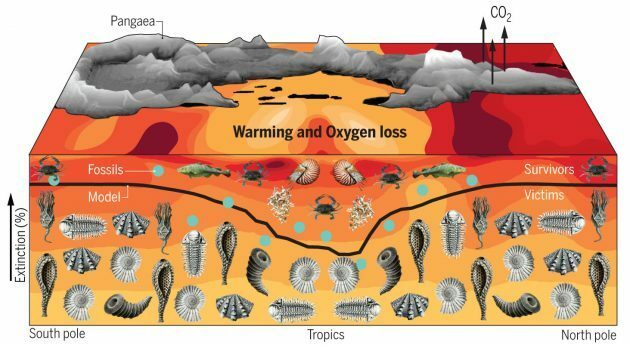 It wasn’t a perfect model (no model is), but it served as an approximation of how sensitive ancient species may have been to a warming climate at the time. Then, to see how the model stood up, they compared it with the fossil record. In sum, the researchers revealed that a warming ocean and therefore low oxygen in the water were in fact likely to have played a crucial role in the Great Dying. Understanding the planet’s turbulent past is an important thing, but much more urgent is what we can learn from it for the future. Deutsch calls the Great Dying a “cautionary tale” for understanding climate change today.